Announcement Giving you a beautiful backdrop to your most precious memories! Giving you a beautiful backdrop to your most precious memories! 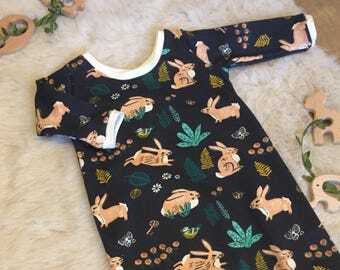 All my new organic rompers are In stock and ready for a new home. FREE SHIPPING ON ALL US ORDERS!! The aqua floral has always been a favorite of mine. Swaddles of black and white look so wonderful on Newborns in photos! Market displays are so fun with all my swaddles as decoration. Love the log poufs paired with reclaimed wood decor. Soft leggings for your baby, Yes please! Quality and satisfaction is my goal! Stitched in Seattle was founded in 2010 when I decided to turn my passion for sewing and designing, into my dream job. My goals are simple, supply a quality and unique product to each of my customers. My hope is that you are satisfied with both your experience and product alike. I only use the highest quality products from thread to fabric. I use the most professional sewing techniques to ensure a lasting quality product you can love for years to come. Now come on in and enjoy small business at its best. Sewing has been a passion of mine since a very young age, my mother and great grandmother being my inspiration that only seems to grow with age!